Welcome to the Frequently Asked Questions page of Langerman Diamonds e-shop. Our goal is to make your shopping experience as easy as possible. If the question you're looking for is not listed, please contact us. Are your color diamonds enhanced or treated? All our diamonds are natural color diamonds. 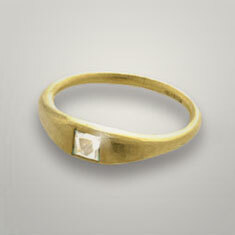 Treated color diamonds are a completely different product that operate on a different market. There is no comparison. Do you deliver diamond certificates? 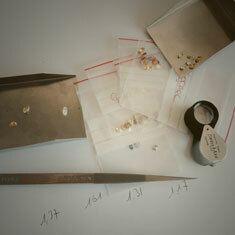 As our inventory is very large and regularly updated, we don't make certificates for each of our diamonds. Once a diamond is sold, we can obtain a certificate within a few days, upon request of the customer, from a laboratory in Antwerp (EGL, IGI…). 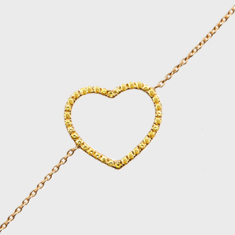 We do guarantee that all our diamonds are natural. 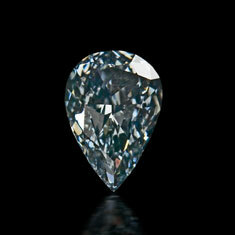 A certificate isn't absolutely necessary unless you want to re-sell your natural color diamond. But once you will have your natural color diamond, you will love it so much that you’ll probably never want to be separated from it! How important is the clarity of natural color diamonds? 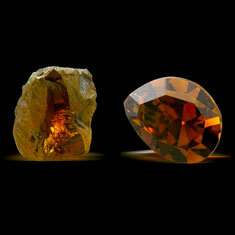 The most important criterion to assess the quality and value of natural color diamonds is their color. Clarity is not as crucial, as long as the imperfections do not interfere with the play of color or with the sparkle of the stone, and that they are not visible to the naked eye. This is why certificates sometimes do not mention the clarity of the diamond. How do you evaluate diamonds - what criteria do you look at? What is important when evaluating diamonds is the four C's: Clarity, Color, Cut and Carat. 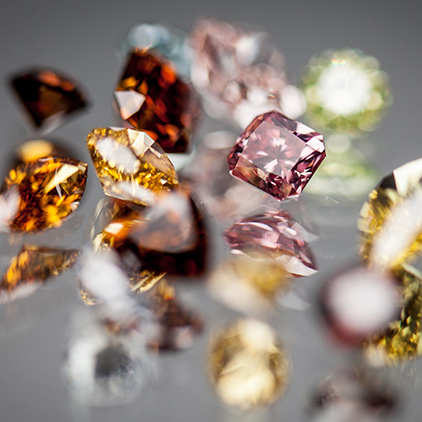 For natural fancy color diamonds, the color is the most important for determining the price. Some colors, such as red, green, pink and blue are more rare than others, and therefore more expensive. Also, if it is a very intense or pure color this will raise the price, regardless of which color it is. The quality and clarity of the diamond will also have an impact, a diamond with no or few impurities will be more expensive than a diamond of a lesser quality. 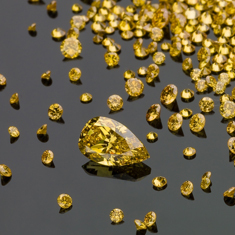 The price of diamonds is like that of gold, it follows its proper market fluctuations. The market price and prices obtained at public sales will therefore also be of importance as they indicate these fluctuations. Why is grade or clarity not a search criteria for natural color diamonds? Natural fancy color diamonds differ from colorless diamonds in a lot of aspects – and the importance of clarity is one of them. Because natural color diamonds are so rare - only one diamond out of ten thousand is a natural color diamond – clarity is much less important as a quality mark than it is for colorless diamonds. So long as the clarity of the diamond doesn’t affect the beauty of the color in a negative way, it is considered of little importance when evaluating a colored diamond, and thus also as a criteria for purchasing one. To give an example, a fancy pink or blue diamond of SI grade, which can be considered as a fairly average clarity for a colorless diamond, can if the color is beautiful be something very rare and sought after, and will command a very high price per carat despite not having a perfect clarity. Can I buy rough diamonds to polish? Since there is a lot of demand for rough diamonds, their price has gone up and it is actually more interesting to buy polished diamonds than to buy rough stones and have them cut. Also, the geological structure of the rough diamonds from our online catalogue is just so beautiful and very interesting in itself that we would rather leave them unpolished. How and why should I become a member? Can I access your Professional website? 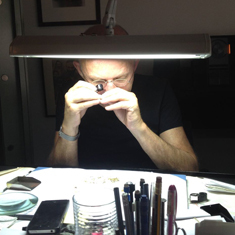 If you are a diamond dealer or a jeweler, you can subscribe to the Langerman-Diamonds professional website (please complete the form on https://www.langerman-diamonds.com/pro-subscribe/). 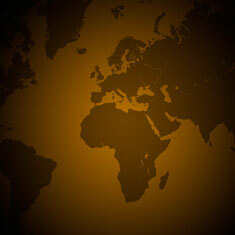 It will give you access to our wholesale prices, and other promotions or professional newsletter. The easiest and safest way is to transfer the money directly to our account. We accept payments with credit cards (Visa, Mastercard, American Express) for amounts up to $3,500. For security purposes, we will ask you to do a bank transfer for all purchases above this amount. We accept payments with Bitcoins for amounts up to the equivalent value of US$3,500. For security purposes, we will ask you to do a bank transfer for all purchases above this amount. Will additional taxes apply to my purchase? Unless otherwise stated, all prices mentioned on the Site exclude the Belgian VAT (Value Added Tax). Individuals and companies: the sale is taxes included, the Belgian VAT of 21 % will be added. Individuals: the sale is taxes included, the Belgian VAT of 21 % will be added. Companies: the sale is taxes excluded (provided we are given a valid intra-community VAT number). Individuals and Companies: the sale is made taxes excluded. However, Buyers are bound to declare this import in order to conform to the laws and regulations applicable in the country where they reside. 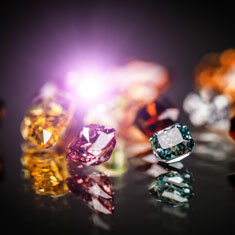 You will find all the necessary information concerning our return policy in our General Terms and Conditions (articles 9 and 10) (https://www.langerman-diamonds.com/info/legal/). As reputed diamond dealers, we are used to work and deliver our products worldwide. We use shipping companies specialized in diamonds such as Brinks, Malca Amit or FedEx. We send the goods as soon as we have received your payment. Delivery usually takes 24 to 72 hours.